If Gaudreau decides not to sign here it isn't because of a lack of opportunity. To suggest we need to make even more space on our already depleted roster is just wrong. There is more opportunity on the Flames than on just about any NHL roster. It also isn't a strike against Burke. The Flames have shown a willingness to sign Gaudreau, a commitment to college kids, and have given prospects plenty of opportunity. There is nothing else Burke can do. If Gaudreau decides to play another year in order to sign somewhere else it is because he has another destination in mind. It's a harsh, harsh world out there, and Burke accepted a harsh, harsh job. You're probably right, it might be wrong to point the finger directly at Burke. But, he has hardly created an environmnent friendly to signing Gaudreau. He has publicly indicated reluctance to sign Gillies (blows my mind). Burke knows better than anyone that it's all about appearance and perception. Burke fails to sign Gaudreau, it'll be his downfall. I'm quite confident. That said, I think he signs here this season. Fingers crossed, that this post is a moot point. Burke said he wasn't sure if Gilles is ready to go pro. He didn't say he wasn't going to sign him. Gaudreau would have to go WAY out of his way to interpret that as leading to an unfriendly environment for him to sign in. It really comes down to Gaudreau deciding if he wants to go pro this season. He can finish his degree via summer school and he has nothing left to prove in college hockey so common sense says he will go pro. If he does he has to play for the Flames / Heat. If he decides he wants the extra gym time and finish his education the old fashioned way than maybe he stays in College. Than we can start the debate. But I can't see him burning a year of pro just to sign somewhere else. The decision thus summer will have very it the to do with the Flames. Maybe we don't have to have the debate. Really hope we don't. He and Arnold sign when their season is done, end of story. Well that would make him an educated idiot... wouldn't it? Still I agree who in their right mind would "want" to become a part of that organization up north? as for the voting our guy has fallen behind by a large margin. My understanding of the fan voting for the top 3 have very little berring on the selection process. Voting by fans is more a popularity contest. I will still cast votes, but I won't be concerned about his totals. 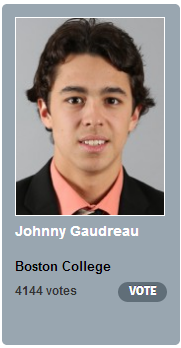 This was in the Calgary sun......Never underestimate a "Mommy"
Flames prospect Johnny Gaudreau — the 5-foot-8 dynamo who seems to be scoring at will in the college ranks — has maintained he will wait until after this season and then consult with his family before deciding whether to turn professional or return for his senior year with the Boston College Eagles. It’s clear now — thanks to Wednesday’s story in the New York Times — that his mother will be pushing the 20-year-old left-winger to finish his degree. “I don’t think he gets it that when you go out there, it’s not going to be all fun anymore,” Jane Gaudreau told the Times. “I don’t think he gets he may be taking the spot of someone who has a wife and three kids.” Wait, there’s more. “As his mom, I’d like to see him take one more year to get a little bigger, a little stronger, and to enjoy his senior year. He’s never had a homecoming. He’s never had a prom. He missed his high school graduation. He said he’d have a graduation picture for me” ... Flames centre Markus Granlund skated by his lonesome Wednesday morning, his second twirl since suffering a suspected shoulder injury March 10 ... Flames tough-guy Brian McGrattan celebrated a milestone against the Ducks, punching in for his 300th NHL game. EEEEEEE it sounds like his mom is going to convince Gaudreau to stay in school. With her logic though, maybe he will never turn pro or get a job in his life… hahaha. "I don't think he gets that he may be taking a spot from someone who has a wife and three kids." no, the way I read it was that fan voting results just goes into the selection process by the committee. If fan voting made a difference, then fans from a huge college or in a big city would decide the award. Minni is a big hgockey market, so they would vote their team players first (and probably on a daily basis). As for his mom, she is going to say that in case he did decide to stay in college. She would support his decision, and if he wants to finish the degree in the summer and graduate next year's convocation, then I'm sure she would approve. She will probably always think of his as her little boy, so she is terrified of him getting hurt. "It's a decision that I need to make pretty soon." Basically mom wants him to go to school. Which makes sense. She is his mom. He wants to do what is best for his hockey career. Sounds like he knows that he won't develop as a hockey player, but he will get a chance to get bigger. Hopefully the Flames can sell him that he can do both in Calgary with the attention of a dedicated training staff and full time ability to focus. So with 10:00 minutes left in the 2nd Period, Gaudreau has 3 goals and 3 helpers Arnold has 1 goal two helpers. Spoke with a buddy of mine who plays for UND and is at the Frozen 4. Word he is hearing is that Gaudreau is not wanting to come out west, AKA Calgary would prefer to stay out east. Really if he doesn't sign what is the best we can get for his rights in a trade 3rd pick 4th best? I hope that he signs I for one thought he would. Would be a huge blow for us if he doesn't. I hope this is just a rumor, because I see Gaudreau as a pivotal piece for the Flames moving forward. Me as well however it comes form the same source that advised me that Knight was not signing in Florida months before it happened. I was a strong believer he signed. Maybe Burke can work out with him, pay him a crap load of money we have the cap space!!! Watched the BC game today. JH is too quick, too agile, and too skilled. If the Flames don't manage to sign him, it'll be a HUGE loss. Considering all the things JH has said about wanting to sign in Calgary, I doubt that "the word" is very accurate. Your buddy at UND was correct about Knight, but didn't he play on the same team as Knight? Anyway, I won't lose sleep about Johnny Hockey refusing to sign with Calgary until it actually happens. He has always said good things about signing here, and I doubt he a Schultz. Despite what his mom has said, he can sign here and finish his degree. Besides, we signed Bryce Van Brabant to protect him. BVB can switch to RW and Arnold can play center on a killer line. Yeah he played with Knight...It came up in conversation when I mentioned that JH had a hot day the Flames faithful were looking forward to him playing here. He just made commented he heard mention that JH wanted to stay out East, that a trade was trying to be done to appease him...Time will tell. Whether he signs or not, there's got to be a way to end this BS of not having to play at least through your ELC with the team that took the chance on you. 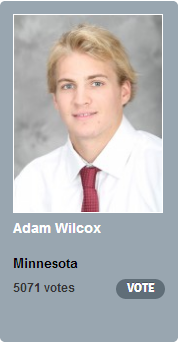 I've been waiting to see this kid in action forever and voted every day for him to win the Hobeybaker. Don't let us down Johnny! This is why he should do the honorable thing and sign with Cgy, this year or next I do not care, if he opts to finish his schooling fine, as long as he signs. Why should he sign, simply because Cgy drafted him and has showed faith and support in him where others had not, such things normally buy long term loyalty to a team, but not always. If JH fails to do the proper thing ans sign with Cgy, then I really hope we get some decent value out of him, if he dose not want to be here then the hell with him. However, I like many Cgy fans, have been waiting to see him in a Cgy uni, there is just so much potential for him to be the net St. Louis/ Fleury of the NHL, possibly even better than either of those two and it would be so great to watch him do that in a Cgy uni! I will say this though,if is mother has so much input in his life, that he is not sure what he wants to do, I have a feeling much of this sty out east crap is from his mother. I really hate when family members but into the hockey player's career (note: career not their life, they are two different things), shades of E. Lindros here? Possibly. But I do hope he's not a momma's boy and he signs and plays here in Cgy as a super star (well in time). The Justin Schultz situation was so controversial because it was so unusual. There is nothing to suggest JHG will not sign with Calgary. If he stays another year which is very possible the nerves will jangle because he's such an exciting prospect the thought of losing him is pretty scary. But he will almost certainly sign with Calgary at the end of his time with the Eagles.